MUZAFFARABAD, Jammu and Kashmir, June 25, 2012 (ENS) – Wildfires have destroyed an area of forest stretching several kilometers along the Indo-Pakistani border in Kashmir. Crews have failed to extinguish the flames due to lack of appropriate tools and an insufficient number of personnel. “Fire is advancing on both sides of the border because we do not have suitable services and measures to control it,” admitted an officer who spoke on condition of anonymity as he could be put on trial for disclosure of organizational flaws. People believe that the fires were sparked by lighted cigarette butts thrown down by residents from the nearby community. “Flames of the fire could be seen from a long distance and the temperature of the area has increased,” said Riaz Hassan, a social worker, who visited the scene along with officials. “Explosions of minefields have also caused damage to green trees and wildlife,” said Hassan. India and Pakistan have mapped minefields along the Line of Control in Kashmir, where heavy military presence and operations are causing ecological losses in addition to human causalities. 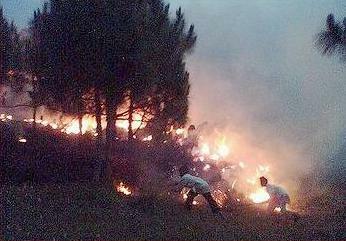 Since the beginning of the tropical summer, sporadic wildfires have erupted on both sides of the Line of Control, which divides the disputed state in two – one part controlled by Pakistan and the other part controlled by India. A series of similar wildfire incidents, some described as arson, have destroyed a large forest area in Kashmir’s southern region. 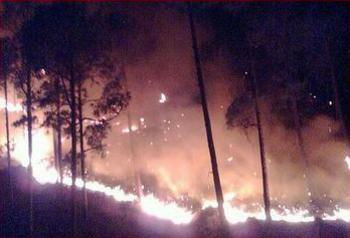 Hot, dry weather conditions have been blamed for sparking some of the intermittent fires. At least three homes were partially damaged when they set ablaze by fires that erupted in nearby forests in a number of localities in the Southern Mirpur division. Farmers have lost livestock and fodder stored on the forested lands. Police have registered cases against 40 persons for inflicting purposeful smoldering, arson and others harms to forests in the southern Kotli district, however, there have been no arrests yet. Officials accuse nearby communities of abusing the forests to further their livelihood. “People living in areas adjacent to the forests intentionally carry out grassfires because they believe that it regenerates richer grass, which is used as food for livestock,” says forest officer Rehman. In Pakistan-administered Kashmir, 88 percent of rural populations largely depend upon forests for their livelihood, and 89 percent of households use wood for cooking and space heating. Contributing 0.3 percent to the country’s Gross National Product, forests supply 32 percent of Pakistan’s total energy needs in the form of fuel wood.